At the same time, my family began to get used to our new home. My son, Saeed, then 6, and my 5- year-old daughter, Alma, began school. My wife, Suzan, who trained as a biomedical scientist, took time off as our children adjusted to their new life and I started my demanding job. In no time, we all made many wonderful American friends. It was a hopeful new beginning. A few months later, things changed radically. Although our relationships with the American people — including the American Jewish communities — were growing, political ties with the Trump administration deteriorated. In December, President Trump announced the United States’ recognition of Jerusalem as Israel’s capital and his intention to move the American Embassy in Israel there. By that point, it had become clear that the White House was fully embracing the right- wing Israeli agenda. The Future Wars conference explored the impact of new technologies on war and it took place on the 10th November at Birkbeck University of London. Below you can watch video clips from some of our amazing speakers! Welcome to this blog entry from Lydia! You might have heard about my time here with London CND from my previous blog. 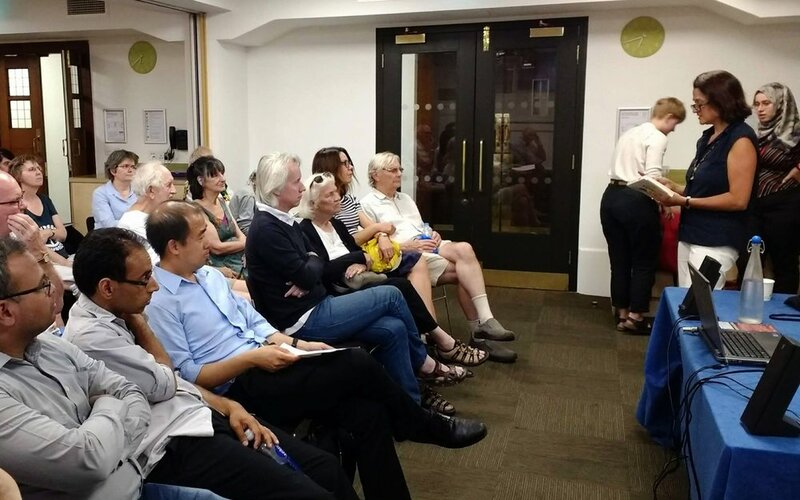 Last Monday, I had the opportunity to help out with London CND’s screening of The Man Who Saved The World, part of our annual ceremony to commemorate the victims of Hiroshima and Nagasaki. With 50 people attending, many of whom have been members for decades, it was truly inspiring to see everyone come together for the purpose of remembering those who were lost to violence, and maintaining the endeavor for peace. The evening started with a warm welcome and talk from Catherine West MP; a woman admirably passionate about the fight against nuclear weapons. She gave a heartfelt speech followed by a reading of an extract from Fallout, by Fred Pearce, a book which explored the detrimental effects of nuclear energy since dropping the first atomic bomb. The movie began afterwards. Before our eyes played the story of Stanislav Petrov, the man who on 26 September 1983 - a time when the US-Soviet relations were severely strained - prevented not only the start of a nuclear holocaust, but also the end of the world as we know it. Throughout the movie flashed images that reveal the real impacts of nuclear weapons. It stressed that these are not merely a hypothetical issue, but an issue that threatens human extinction by the minute. They are the ingredients to a war which can never be won. The documentary included a mention of a US nuclear missile that really solidified the room’s perception of nuclear weapons. The soldier introducing the missile to Stanislav Petrov described the damage: if all the bombs dropped on both sides of WW2 were combined into a single missile, it would only cause 60% of the damage caused by this one. These were the kinds of missiles that threatened human existence in 1983, and still do to this day. Stanislav Petrov’s actions demonstrate the importance of always choosing to do what is right, despite being alone in believing it is the right thing to do. He demonstrates the reality of the power of the individual in preserving humanity, and in the fight for peace. Most importantly, he personifies the extent to which saving the world - or destroying it - can be truly momentary. “We must learn to coexist like brothers, or perish like dinosaurs”.